The first problem I had was fear. I was afraid of quicking my dogs when using clippers. So they had to go to the scary vet (where they would sometimes get quicked). When I learned about grinding dogs' nails, I was excited to try it. But the first product I purchased didn't have enough power. And my Lupe's tough, black nails, sanded the tool - instead of the tool grinding her nails. As I experimented with different grinders, I made some progress but not enough to keep nails short. I later learned that I was using the tool incorrectly. My other problem with getting nails done was handling my nervous dogs. I knew I needed to go slowly with counter conditioning and desensitization. But I'd start getting concerned about their nails getting too long. I'd move too fast, and set back our progress. Then their nails did get too long.. So back to the scary vet we went. And the more we went to the scary vet, the further back we'd go in our progress of making nail trims a non-scary experience. During the winter holidays, I had some time off work. So I finally decided to get something done. I purchased a grinder that was easy to use and powerful. I stopped worrying about their nails getting too long (I could always train back the quick). And I decided to first work on counter conditioning then just work on doing tiny amounts at at time - daily. I've already posted a video on helping my dog with feet handling. 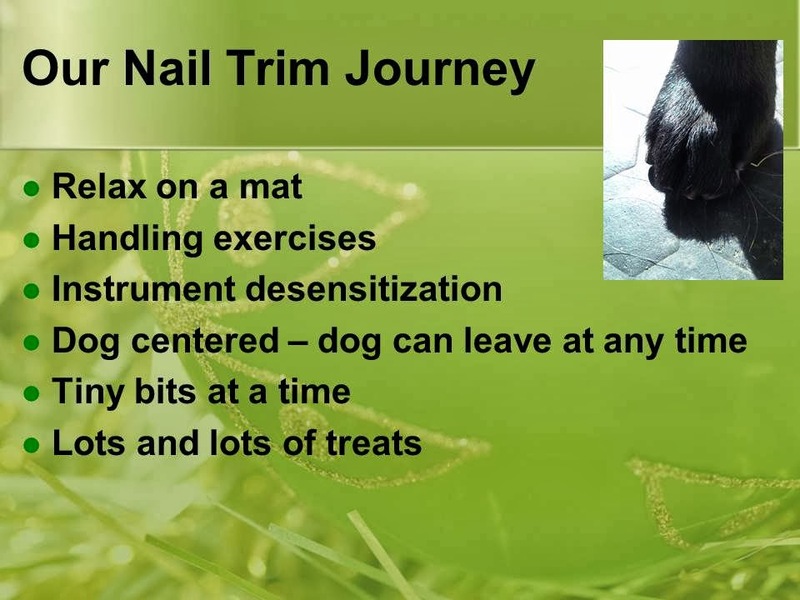 But I've later learned that our success with nail trims goes back even further than that. Nail trims are so much easier when the dog relaxes in a comfortable position. (see the above video). So I'm happy that I spent over a year rewarding my dogs for relaxing on a mat or bed. Another thing that helped was that I gave the dogs the option to leave. I'd try to stop long before my pups had enough. But if I didn't and they chose to walk away, I let them. For Murphy that meant doing only one toe per day for several days. And in the beginning, I didn't even finish one toe. I'd just grind a tiny amount.